"The Screaming Citadel" is clearly heading for a tremendous, satisfying climax, as the whole team is loving bringing Gothic horror to the Star Wars universe. 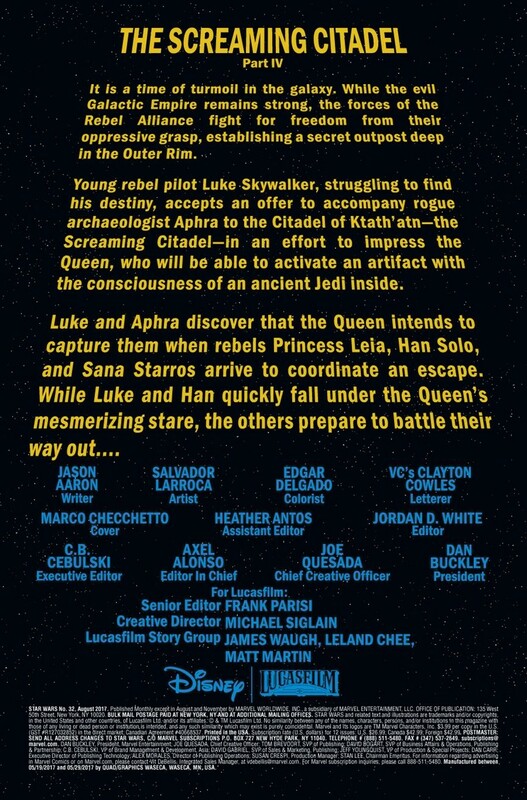 “The Screaming Citadel” – Kieron Gillen and Jason Aaron’s second Star Wars event – is building to a climax. So far, the story’s been a pretty traditional horror plot, transposed on to the rich tapestry of our beloved Galaxy Far, Far Away. 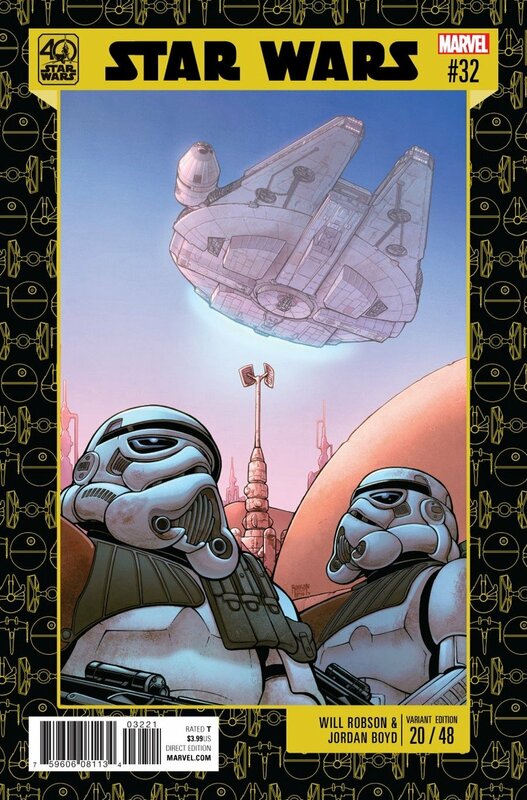 In Star Wars #32, though, Jason Aaron takes the plot in a fair few unexpected directions – and I have to say, I love it. The secrets of the Queen of the Screaming Citadel are gradually being revealed. She’s at the center of a symbiotic hive-mind, and commands her world by sheer force of will. Meanwhile, of course, the ‘gifts’ she demands? They’re consumed. And she loves the idea of feasting on a Jedi Knight. In the Star Wars saga, Luke Skywalker is primarily an agent of redemption. He’s the one whose belief in others motivates them to better themselves, to stand against evil, and to become heroes. How does that theme play out against a backdrop of Gothic horror? The answer, it seems, is very well indeed. 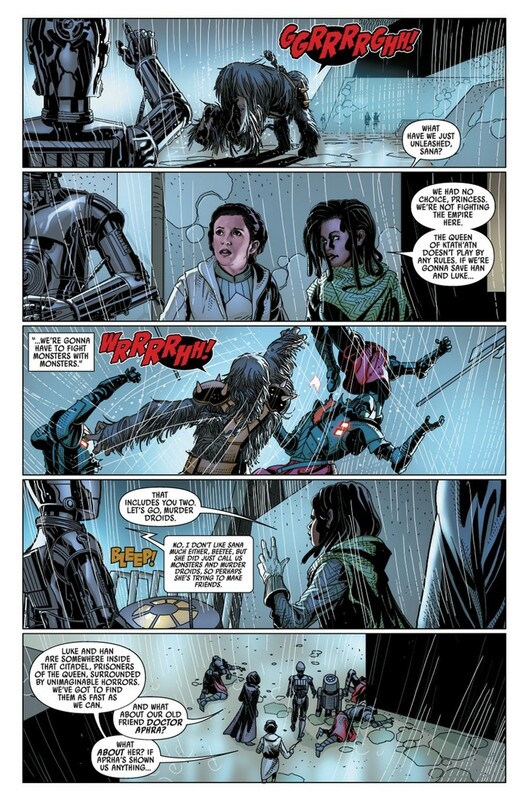 Doctor Aphra’s character arc – influenced so strongly by her brief alliance with Luke – is tremendous. When the awakened Jedi consciousness of Rur peers into her heart, it points to her new sense of guilt. She betrayed Luke to the Queen, but for once, she’s ashamed of what she’s done. Luke Skywalker has left his mark, and it’s one that’s sure to transform the story of Doctor Aphra. Meanwhile, Jason Aaron rejoices in playing with yet more horror tropes. 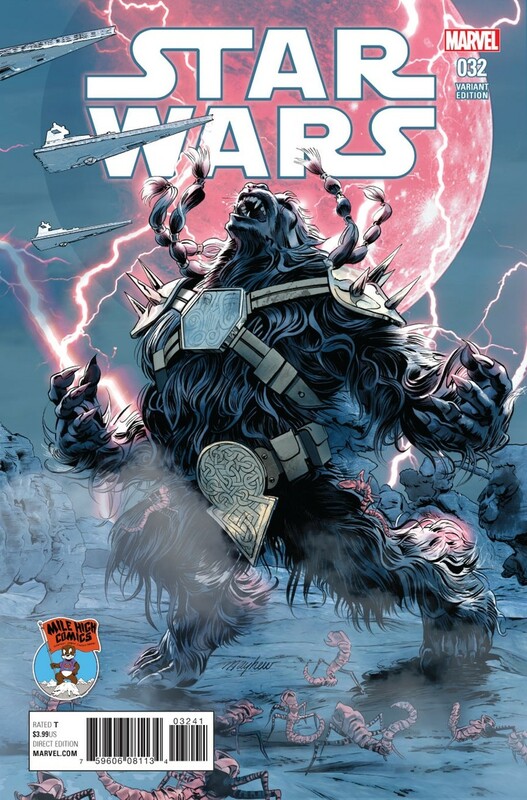 I mean, the issue kicks off with what can only be called a demon-possessed Wookiee, while Aaron continues to use the ‘murder-bots’ to add a wonderful dimension of humor to the plot. 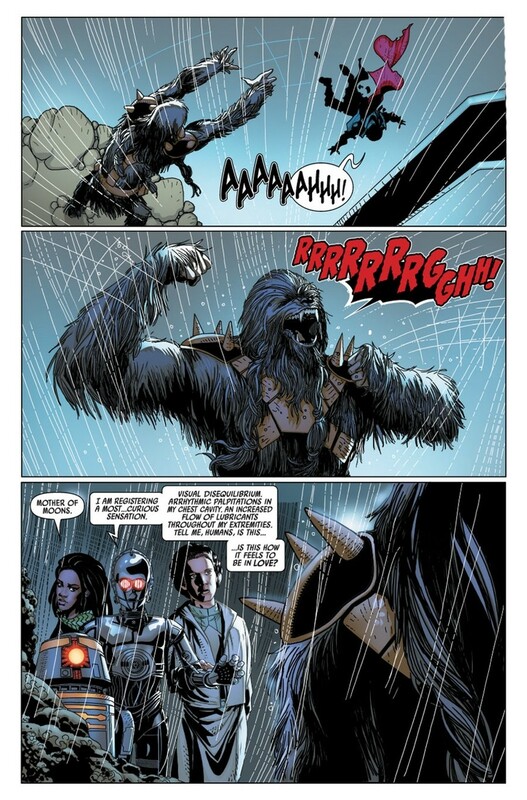 Poor Han is soon under the Queen’s symbiote-induced control – an experience that a strong-willed man like Han Solo would rage against, and a testimony to the Queen’s power. All this comes to a head in the final pages of the issue, where we see what would happen if the symbiotes were introduced to a Jedi Knight. That last page – beautifully rendered by Salvador Larroca and Edgar Delgado – also drops a tantalizing hint: do the symbiotes corrupt? Is the Queen really as evil as she seems, or is she too merely a pawn of the symbiotes? It’s going to be fun to see where the plot goes from here. 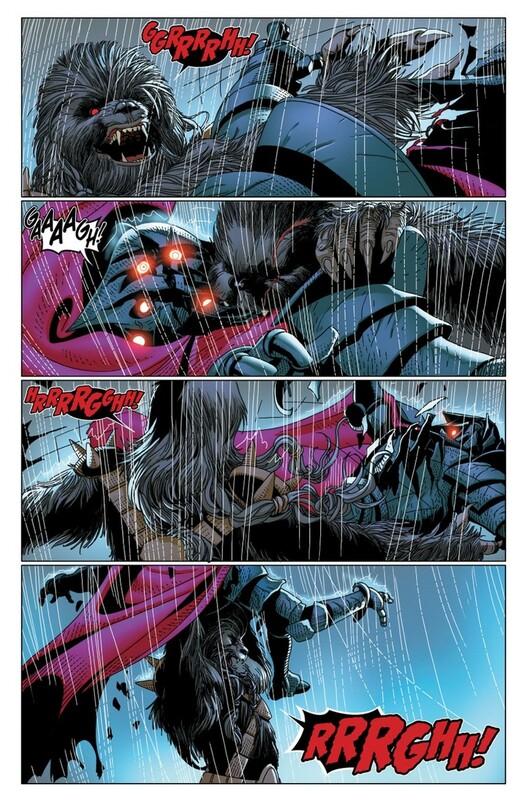 Larroca and Delgado are clearly having a blast in this issue (as artist and colorist, respectively). You can tell they’re absolutely revelling in the horror tropes, particularly the symbiote-infected Black Krrsantan. 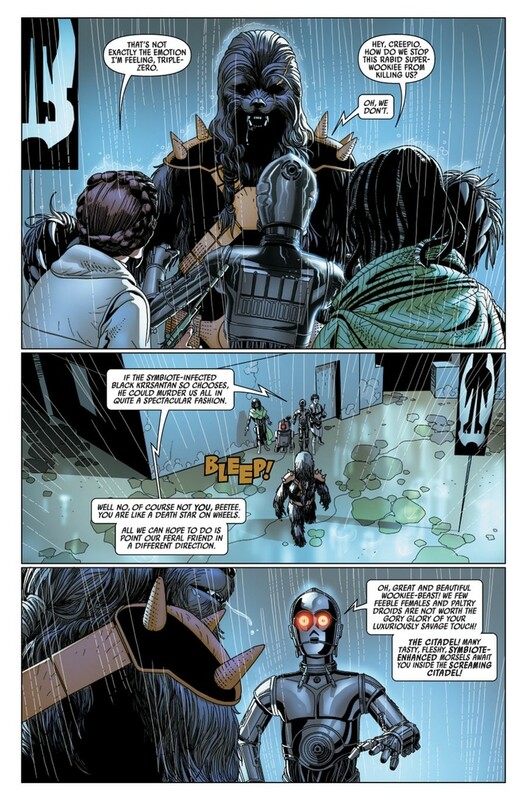 The real stand-out is a single, beautiful panel where Doctor Aphra taps into the knowledge of Rur; Delgado’s color-choice makes that image different to anything else in the book, flooding it with hope and vibrant life. 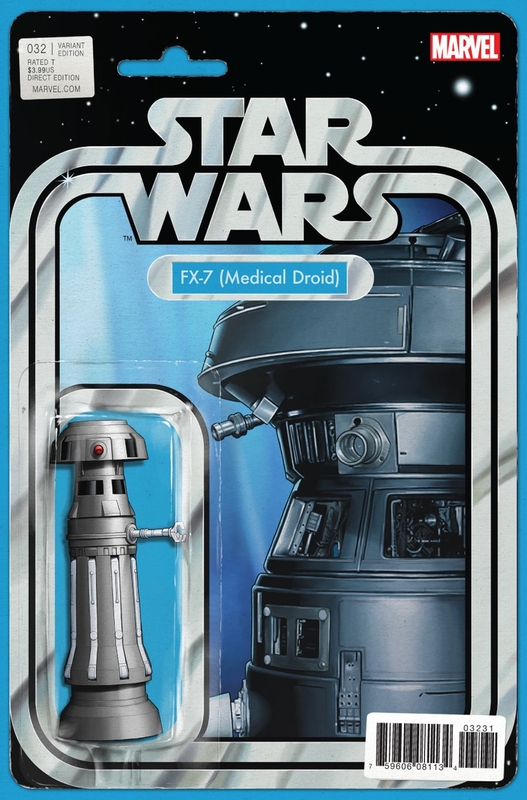 It’s gorgeous, and makes the image a stunning reminder of just what it meant to be a Jedi back when we only had the Original Trilogy. 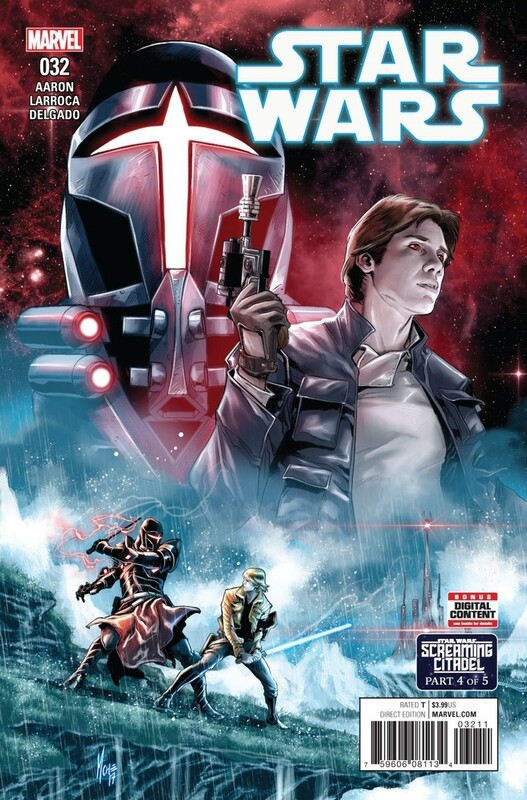 As an event, “The Screaming Citadel” has been weaker than Gillen and Aaron’s previous, “Vader Down.” That said, the twists in this issue really do help us see why Marvel and Lucasfilm signed off on this event, as we’re headed for a climax that should truly be satisfying.